I have found that as my son gets older we are using more online and video curriculum. There are so many more things available for homeschoolers online than there were just a few years ago! 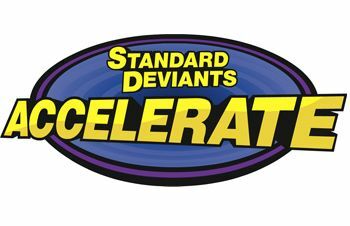 So I was interested to review the new courses from Standard Deviants Accelerate. These classes are designed to be complete courses that use videos, quizzes and written activities to guide a student through the topic. Video – These were usually less than 10 minutes long. Vocabulary – A list of all the important vocabulary covered in the unit. Diagram – This was a drag and drop interface, in which the student drags names onto diagrams, such as the diagram of a cell. Quiz – This is a multiple choice quiz that can be submitted for automatic grading. Written Answer – This section has a few more in depth questions for students to write out the answer to. My 15 year old son didn’t like this program.Â We tried the biology first, with the plan to use it to supplement the biology class he is doing.Â It is labeled for grades 7+, and he is in 10th grade, and he already knew most of what was covered.Â So I had him do the Nutrition course instead, since he needs to cover nutrition as part of a health class.Â His problem with the course is that he doesn’t like the videos.Â The videos jump around a lot, with different people explaining stuff every minute or so.Â He thought that was choppy and made things not flow well.Â The videos have a corny humor, with things like people dressing up and doing skits, and he didn’t appreciate the humor and found it annoying. He would prefer to read a nutrition textbook than watch the videos. I think how well this course works will completely depend on how a child reacts to the videos.Â I think many kids would enjoy them and find them a nice break from textbooks, but clearly not my son. I thought the courses were on the easy side, and I would probably use them as a supplement to a course, not as a full course by themselves.Â The course includes a full transcript of each video, which was very helpful for me as a teacher to have to skim through and see what was being covered.Â And the automatic grading of the quizzes is a big help too.Â The written questions at the end of each unit are well thought out, and you can easily use them as a basis for a discussion.Â The ease of implementing the classes is a big plus to this program. Right now Standard Deviants Accelerate is offering an extremely generous 6 month free trial, so you can see how well it works for your children without investing any money.Â After the six month trial is over homeschoolers can purchase a course for use by one student for $99 for a year, or $24.95 per month.Â With such a great free trial offer it just makes sense to try it out for yourself! Check out more reviews from other homeschoolers here.